PAGO POR ADELANTADO 50% DEL IMPORTE TOTAL DE LA RESERVA. RESTO 30 DIAS ANTES DE LA LLEGADA. NO SE ADMITEN REEMBOLSO POR ANULACION NI POR MODIFICACIONES DENTRO DE LOS 30 DIAS ANTES DE LA LLEGADA. ES NECESARIO UNA FIANZA /DEPOSITO DE GARANTIA A LA LLEGADA DE 20 EUROS POR PERSONA QUE SE REEMBOLSARAN A LA SALIDA SIEMPRE QUE DEJEN LAS HABITACIONES EN BUEN ESTADO Y SIN DESPERFECTOS. LOS RESPONSABLES DEL GRUPO SON TAMBIEN DE LOS ACTOS QUE EN EL ESTABLECIMIENTO SE PRODUZCAN Y MOLESTEN A LOS DEMAS HUESPEDES. In doing so we hope to inform them about the city and make their stay as nice as it possibly could be. Smoking is prohibited in all areas except the two terraces on the second floor. We have free Wi-Fi in the entire building. Touristic information of the city is available as well as tickets for flamencos shows, bus tours, bike rental and boat trips. 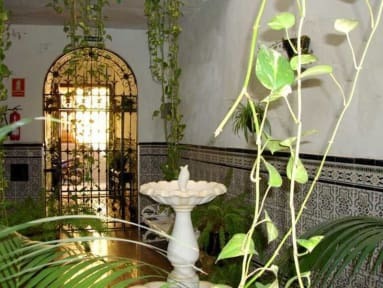 We are in the centre, in the heart of the Jewish Quarter of the city, two minutes from la Casa de Pilatos and five minutes away on foot from the cathedral, the Alcázar and other significant monuments. Among narrow streets and alleys you will be able to enjoy the finest that Seville has to offer. Calle Vidrio runs parallel to Menéndez Pelayo, one of the main streets from which you can get the C3 and C4 buses, which can take you to the bus station in fifteen minutes, whereas bus 21 gets you to the train station. Ten minutes away from you can get the EA airport special bus. The train station is also a ten-minute walk away. The recently refurbished rooms have Tapiflex beds and flame-retardant, anti-insect protected mattresses. We offer double and twin rooms, as well as single, triple, family (four-person) and group rooms of six individual beds. Five rooms have private bathrooms, and for the other fourteen rooms there are six shower-equipped communal bathrooms provided. Several rooms have air-conditioning at an additional cost. Check in from 15:00 PM to 22:00 . Reception is available from 8am to midnight. Extras such as air conditioning (hot and cold), laundry, parking, drinks, sightseeing payment, shows etc. You will have to pay in the reception. The establishment requires a deposit for towels on arrival which will be returned back to them at check out. It is forbidden smoking in the rooms. If you smoke you will be charged an extra cleaning of at least 30 euros per room and per possible damage. Some rooms have air conditioning and its use has a cost of 5 euros per day payable directly to reception. We have towels for hiring, but it requires a refunded deposit of EUR 5 per towel. The deposit will be refunded when you return the towels at the check-in. La habitacion era muy fria, y no tenia calefacion, no avia cocina y nada para areglar al menos un te, quisaz en verano esta bien pero de invierno no la recomendo. Fuimos Sevilla para pasar un fin de semana turístico. Nos alojamos en Pensión Azahar con la intención de poder descansar y así cargar pilas para el día siguiente. La pensión no cuenta con ningún tipo de vigilancia nocturna. En la habitación frente a la nuestra, un grupo de chavales (18-20 años) hicieron botellón a las 00:00, el cual se prolongó a altas horas de la madrugada. Intentamos llamar a la responsable, nos dijo que no era su problema ¿...? La noche siguiente se repitió la jugada.